So going way back to this past Christmas, friends of ours gave us a popcorn machine. 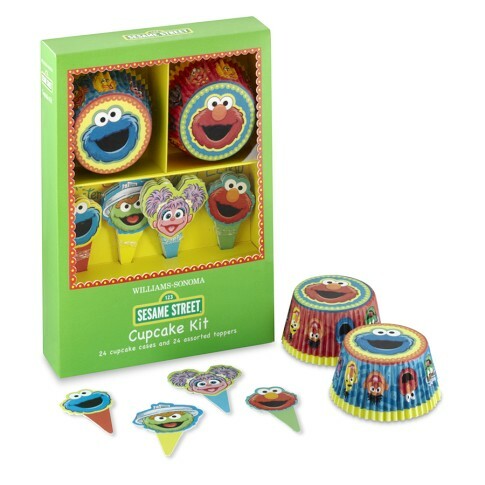 My first thought was “Okay, one of the kids is having a carnival party this summer.” Funny how these ideas come about, but that is how this one was born. Nailing down the details for this party was tricky. 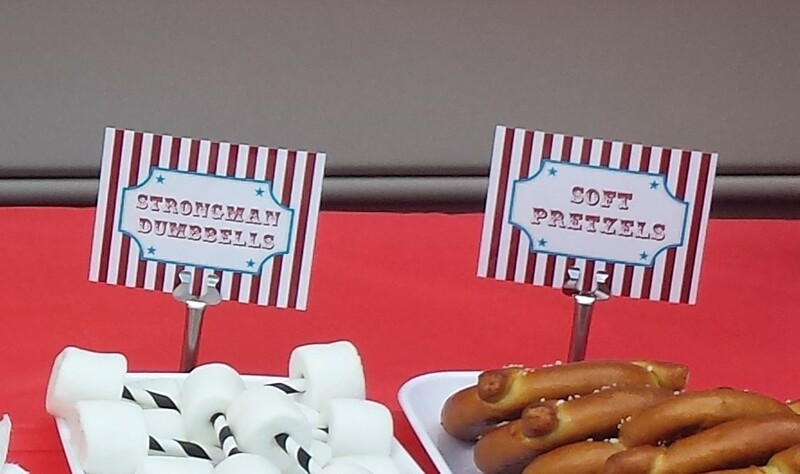 I wanted to include classic carnival foods, but also some non-junk foods. And the games needed to appear to kids ranging from 2 to 11 and be self-operating. 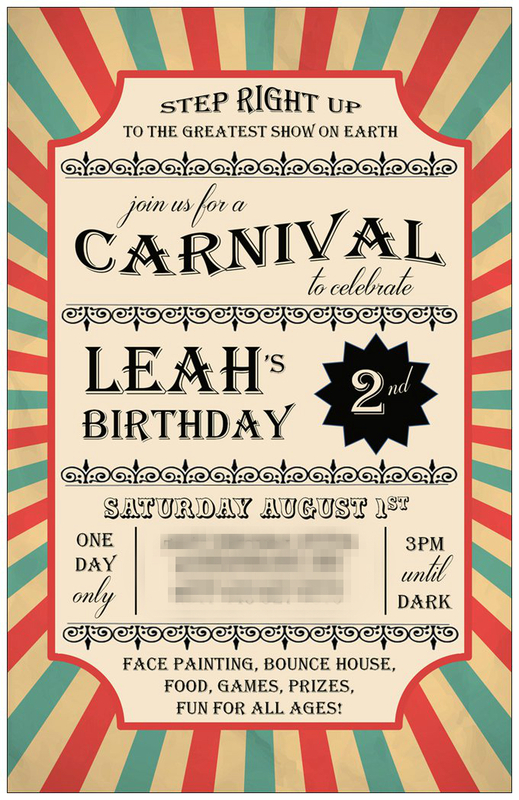 I found a few inspiration pics from a Google Image search and designed this invitation for Leah’s party. 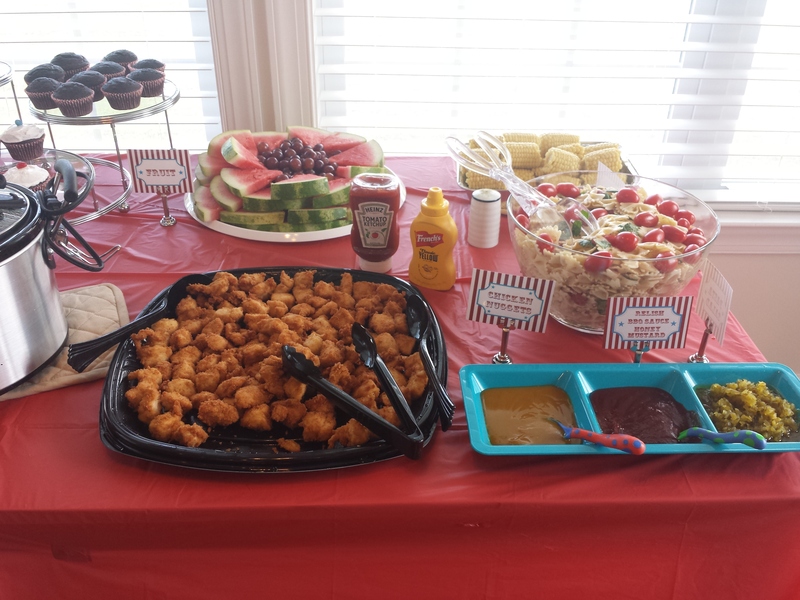 We had minimal decorations since the food and games were kind of the stars. 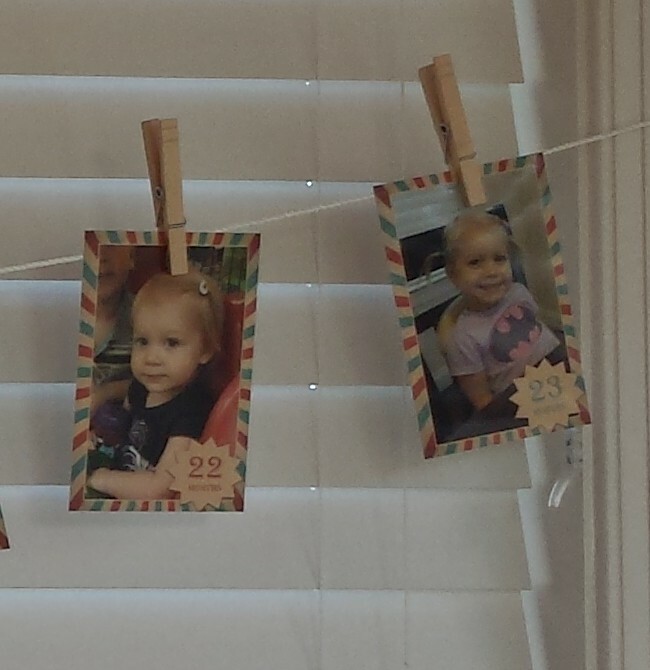 I put up streamers and balloons in the kitchen near the food, but that was about it except for the pictures. 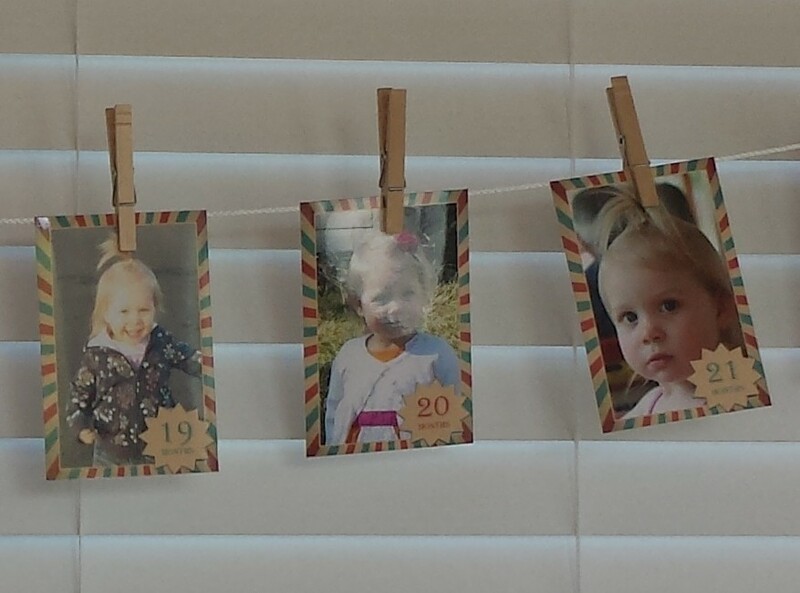 I have done this monthly pictures display for both of my kids for their 1st and 2nd birthdays. It’s fun to see how quickly they’re changing! The cupcakes (ironically) were the only thing that went really wrong. 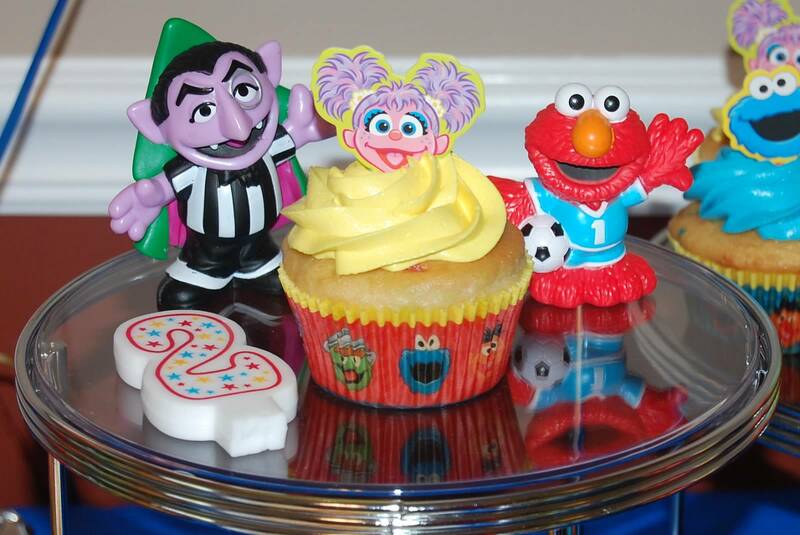 First off, the cupcake liners I ordered from eBay arrived 2 days AFTER the party. Fail. Luckily, I have a stash of liners and I actually had some that were really perfect for this. Crisis #1 averted. I made plain old chocolate cupcakes and planned to frost them with a new icing recipe I found for a whipped cream icing. I was making the icing at the last minute and I was so busy that I kept turning on the mixer and walking away and forgetting about it. Between that and the humidity, my icing was soup 😦 But a call to my mom and father-in-law to pick up some canned frosting and my sister and brother-in-law icing the cupcakes at the last minute saved the day! Box cake and canned frosting, and you know what, they were delicious. Crisis #2 averted. 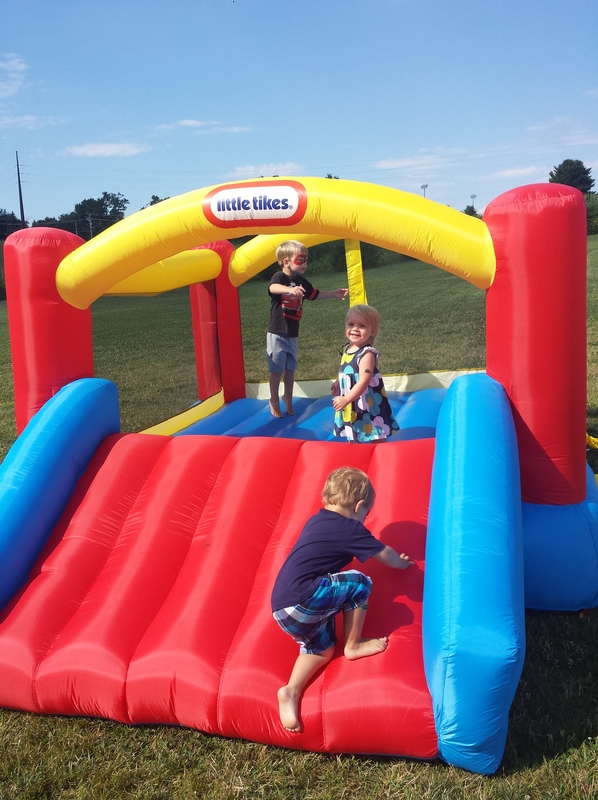 I really wanted to have a bouncy castle (as my kids call them) for this party. It seemed fitting. We decided to purchase one instead of renting. It seems a little extravagant to me, but hopefully it’s a good investment since we can use it for future parties. 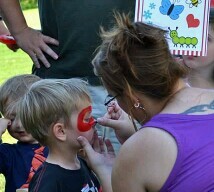 I also wanted to include face painting. I was reluctant to hire a pro for this since we had already spent money on the bouncy castle so I purchased a face painting kit. 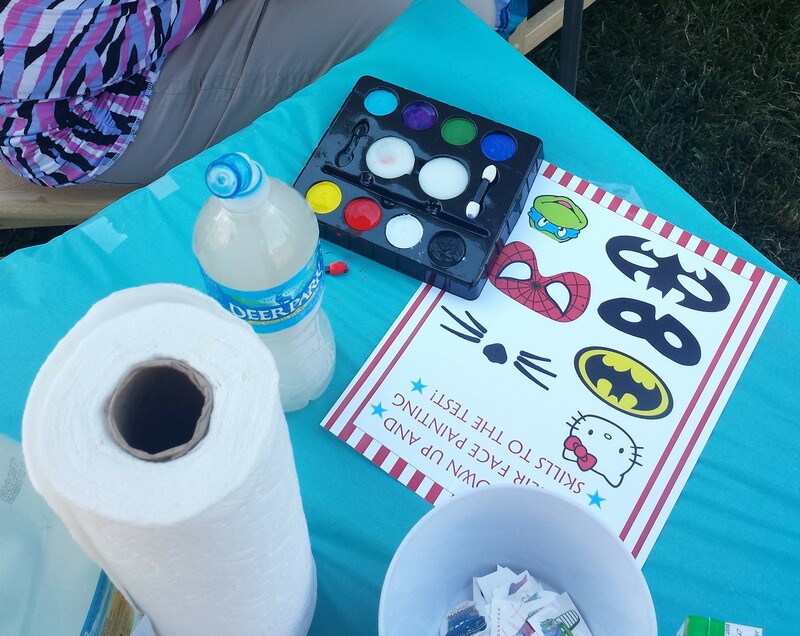 I printed out some simple ideas and hoped the parents would be willing to try their hand at face painting. 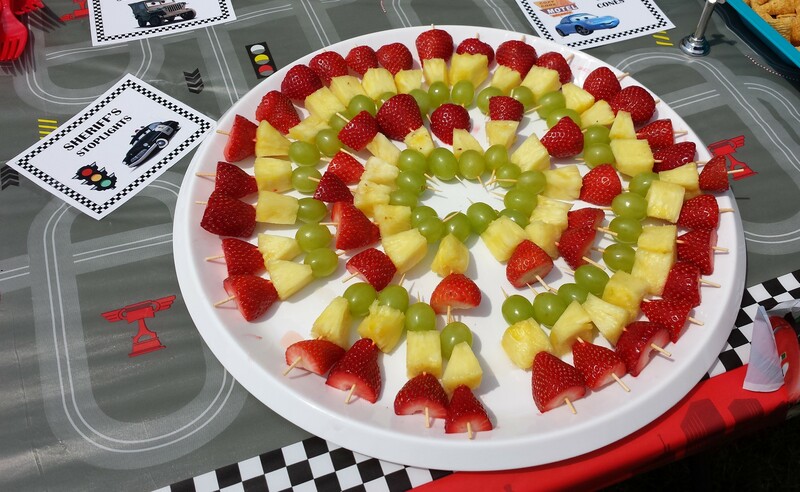 Many parents did give it a go and the kids looked great! Unfortunately, sweaty faces + water guns and we had a lot of smearing and I’m pretty sure there is a fair amount of paint on the bouncy castle. Oh well, it’s washable. We had 3 games. 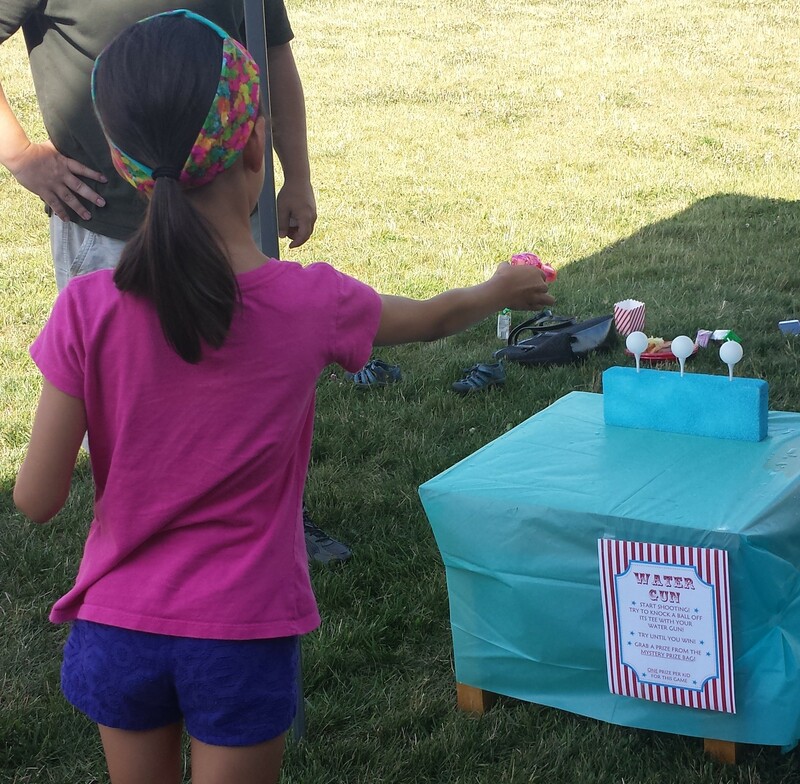 They were set up so that each child could win 1 prize from each game, and the idea was that those 3 prizes would be their party favor. The games were fairly self-explanatory though my husband did supervise a couple of them. And since we were left with more than half of the prizes at the end of the party, I don’t think how to win a prize was quite clear. I made this ring toss set with empty iced tea bottles, a cardboard box, and a set of rings (found on Amazon). 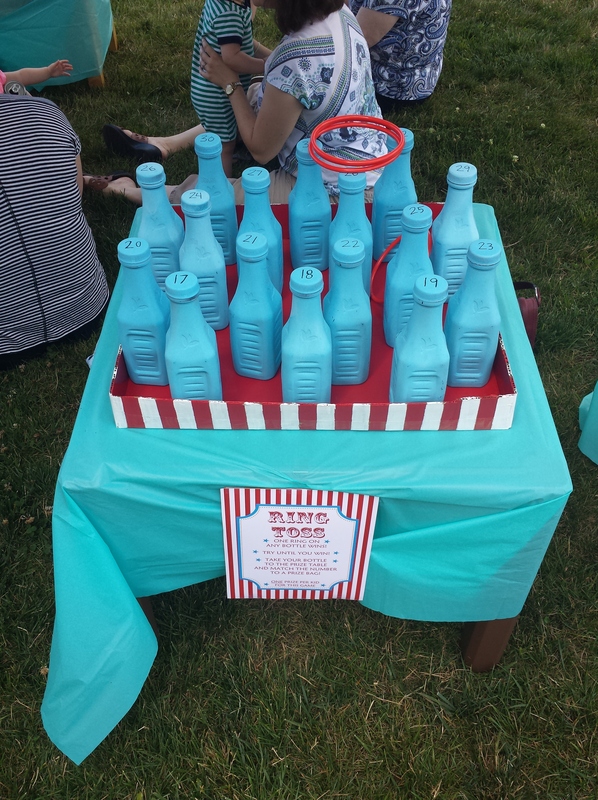 Each bottle was numbered, and each number corresponded to a prize bag. For the fish bowl game, I used clear plastic cups and taped a picture of a fish with a number on the bottom of each one. The cups were then filled with water. 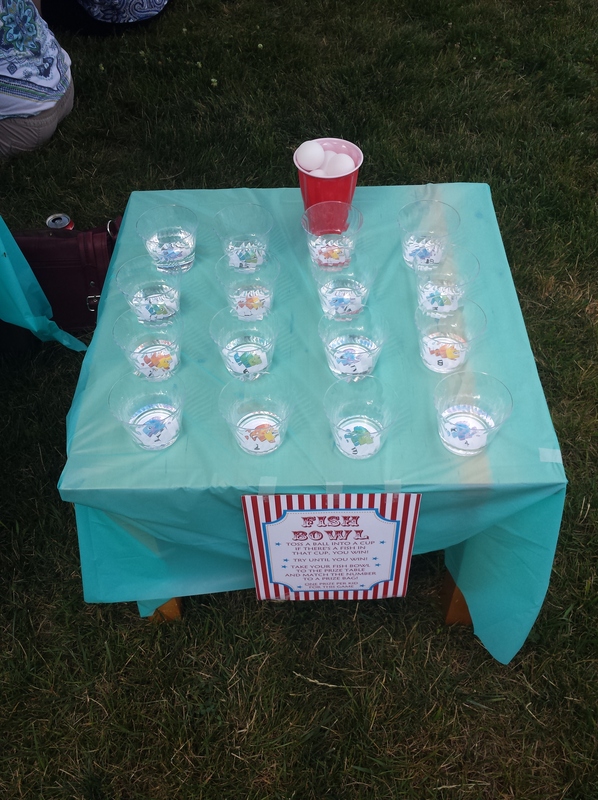 The kids tossed ping pong balls and tried to get one in a cup. Again, the numbers corresponded to a prize bag. For this game, I stuck golf tees in a block of stryrofoam and the object was to shoot the balls off their tees with a water gun. I couldn’t figure out how to do prizes for this game so I just did a grab bag of prizes instead of individual ones. The kids did play this game, but the water guns were a hit on their own (I thought they would be!). 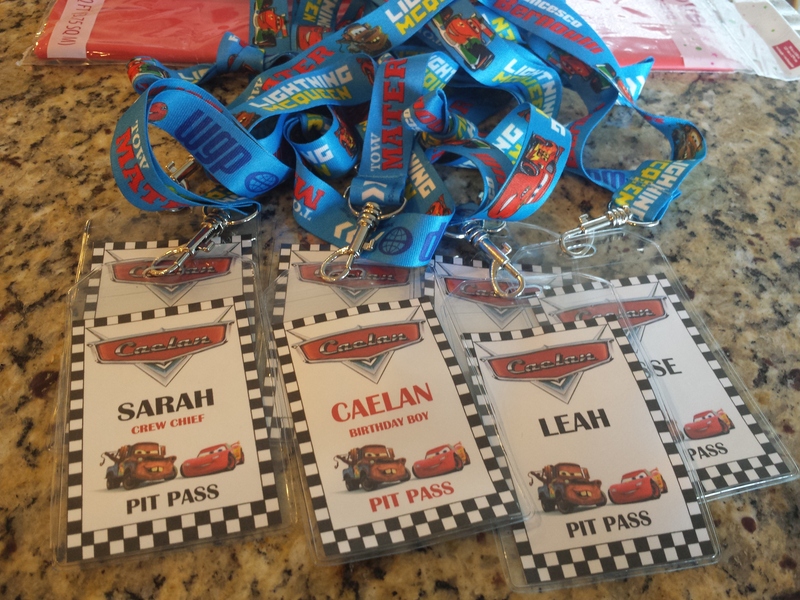 I’m going to do a whole post on Caelan’s birthday party this year! 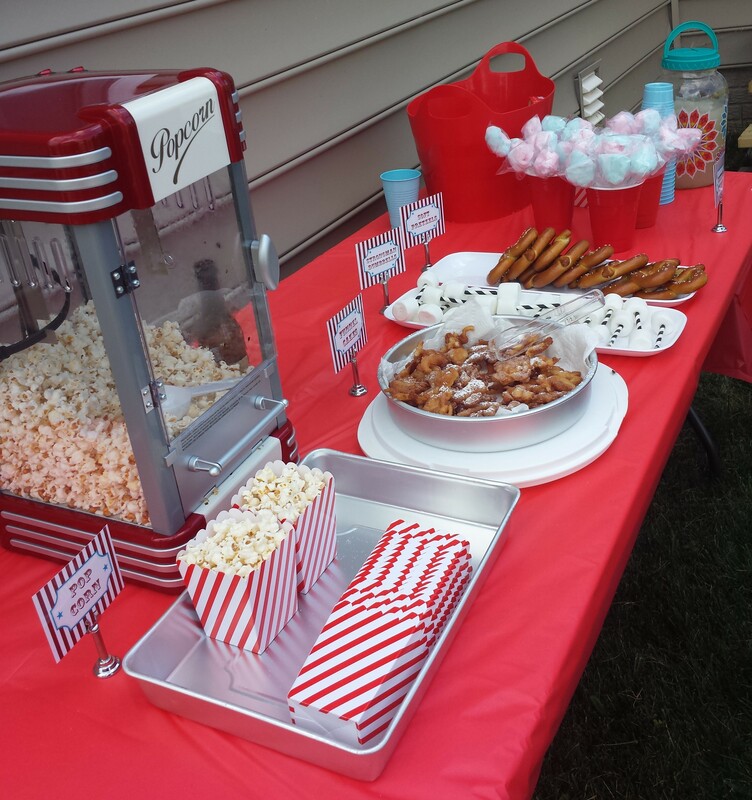 This party was THE party I have been wanting to do for years – super theme-y! And honestly what made it so cool was that Caelan loved it so much!! In the weeks leading up to the party, he watched me buy all the supplies and do all the prep and he was just loving every bit of it. 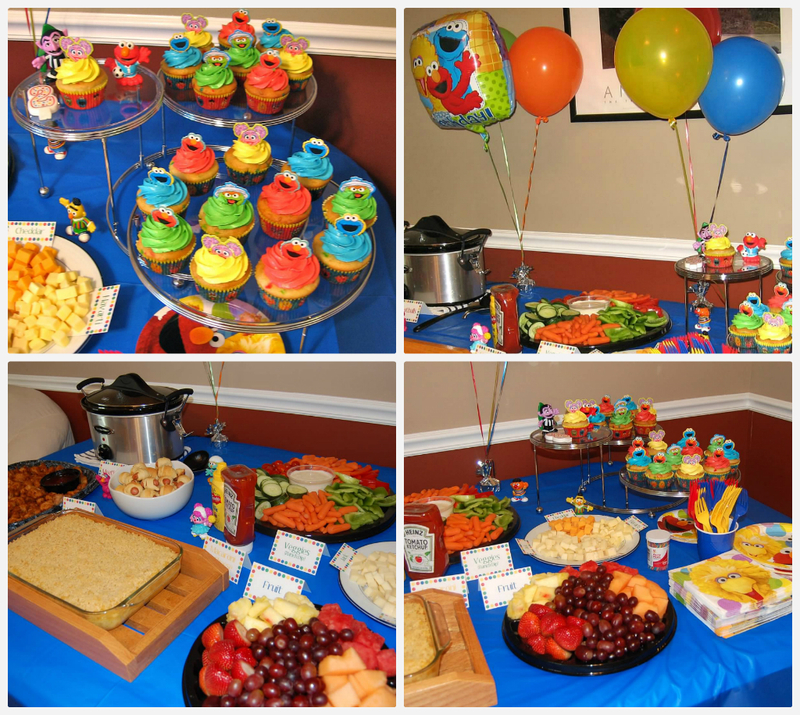 I could have done a super theme-y party for his first birthday and it would have been cool, but at age 1, he would have had no clue. 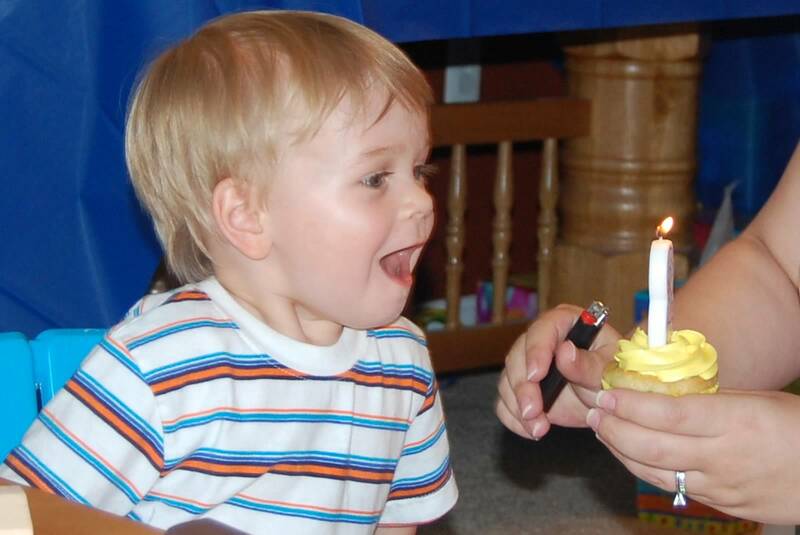 At age 4, he was really into it! 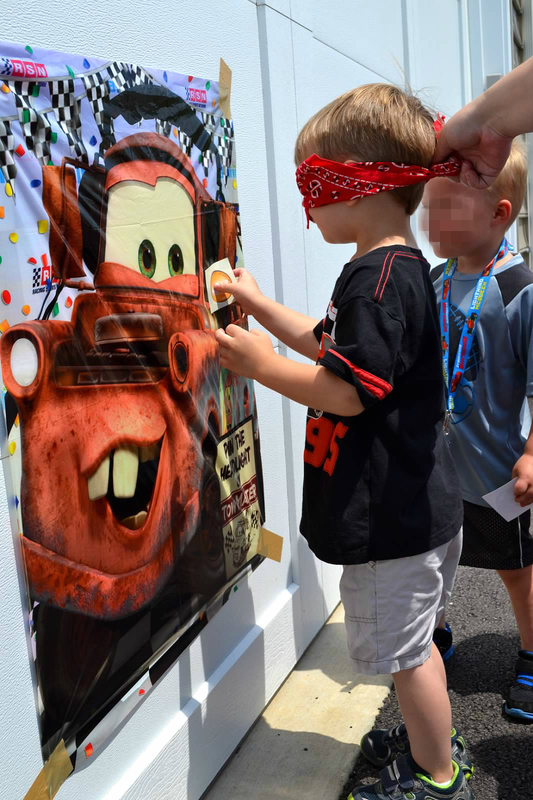 Here’s how we put our Disney Cars themed party together!! 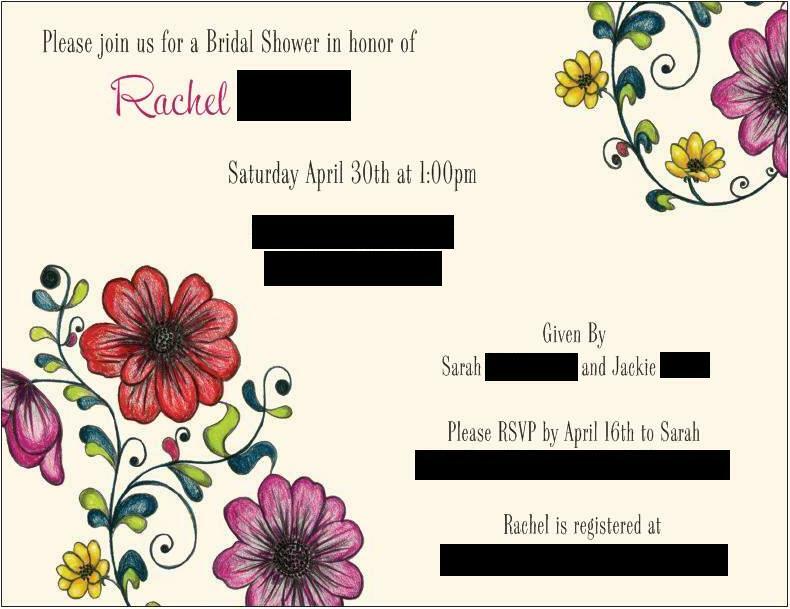 EDIT: I forgot to include the invitations!!! I combined a few ideas I saw online and designed these invites! I almost chickened out of making this cake. 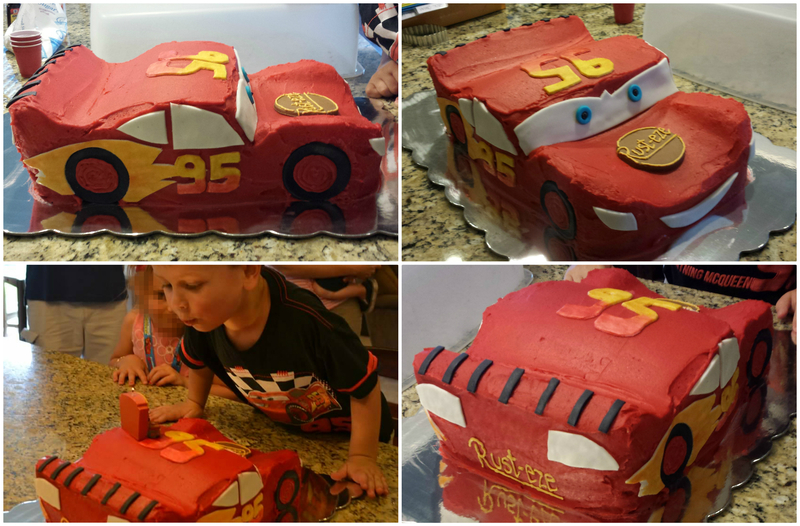 I almost did a regular sheet cake with Lightning McQueen drawn on it, and that would have been cool. But I’m so glad I went for it and made this Lightning McQueen *shaped* cake! For the cake, I used this recipe which I have used before and I knew it was very sturdy and easy to carve. I made 2 batches, in 2 9×13 pans. I also made 2 batches of my favorite vanilla buttercream icing. I reserved about 1 cup for details and tinted the rest red with Wilton gel color. Red is notoriously hard to make REALLY red but I managed to do it this time by adding half a bottle of the red gel color and then letting it sit in the fridge for about a day before using it. I looked up a few tutorials online and printed out some pictures of Lightning from a few different angles and then used all that info to free-hand carve the cake into the shape of a car. I frosted it with the red buttercream. Most of the shaped Lightning cakes I saw online were covered in fondant. To be honest, fondant cakes are not my thing so I knew I wanted to stick with buttercream. I did make the detail decorations with fondant. I grabbed a Pin-The-Headlight-On-Mater game from the party store. It came with 8 headlight stickers, but since we had more than 8 kids, I just color-copied the stickers to make more. 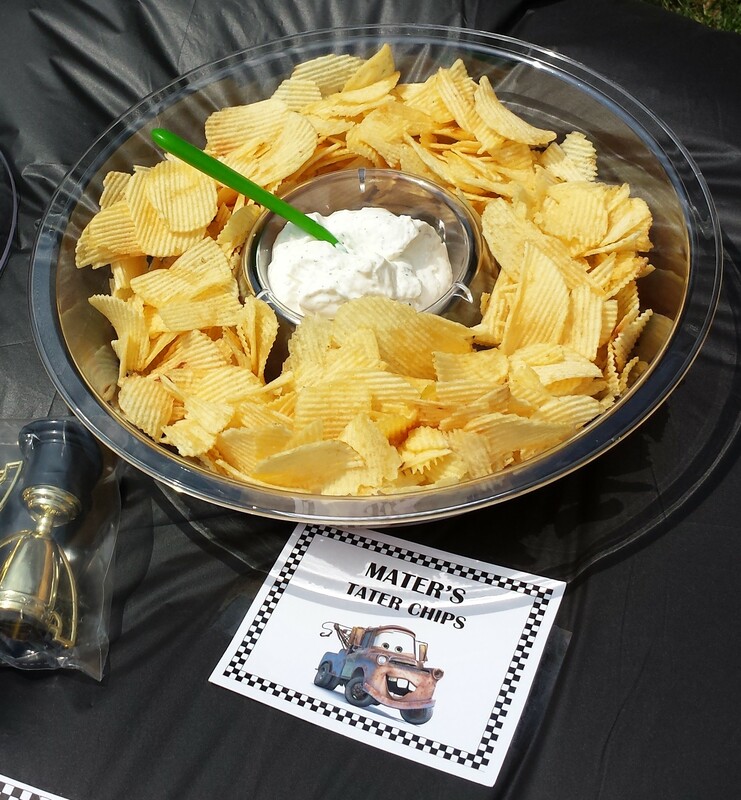 The major game for this party was the Piston Cup race! 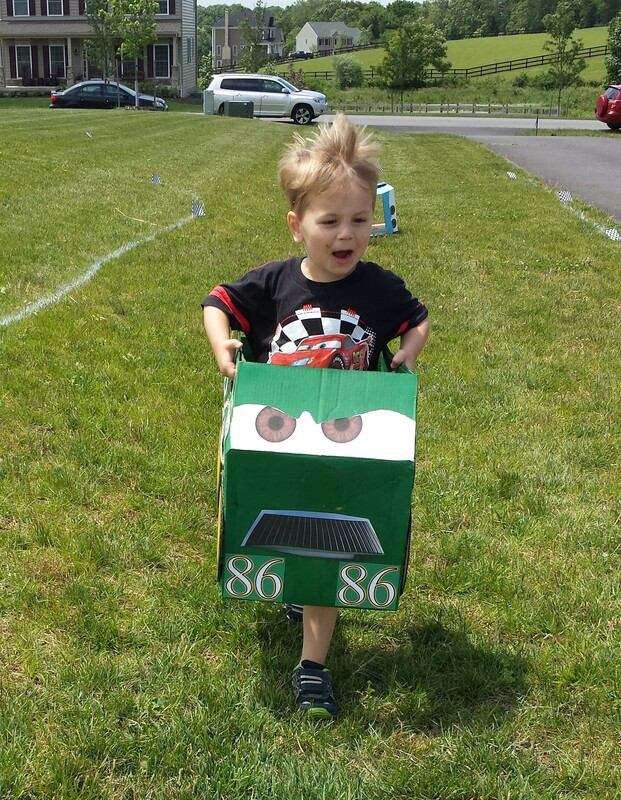 We had stacks and stacks of boxes leftover from our move last year so, over the course of several weeks, I picked out 6 boxes and made them into cars! 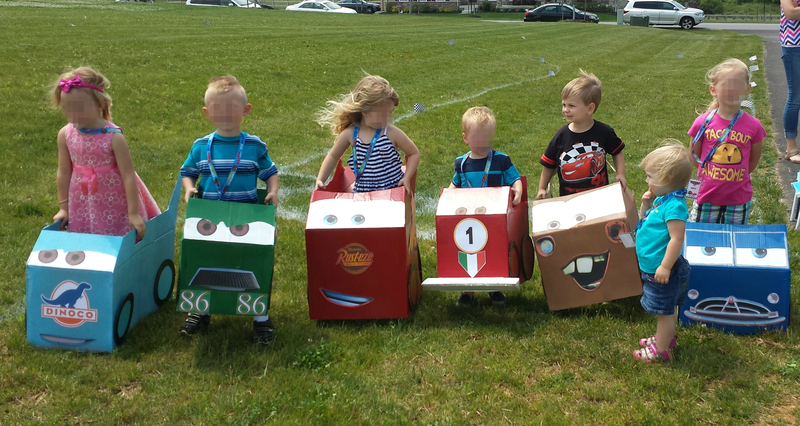 I chose to do Lightning McQueen, The King, Chick Hicks (Caelan’s favorite), Doc, Francesco, and Mater. 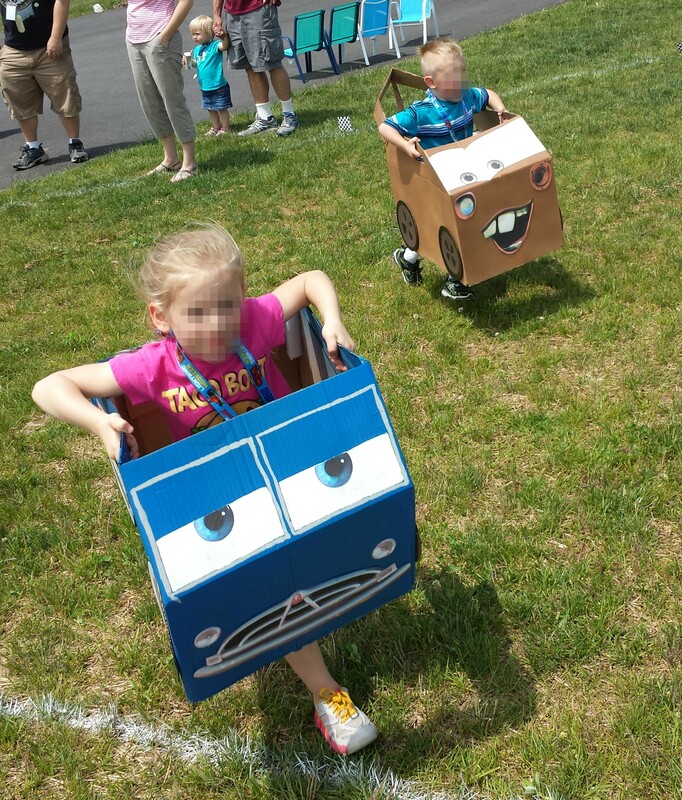 I used scrap pieces of cardboard, styrofoam, and a ton of hot glue to make the cars a little more stable. I spray painted them their main colors and then used acrylic paint and a foam brush for the eyes and any details. The rest of the details I printed out and glued to the cars. 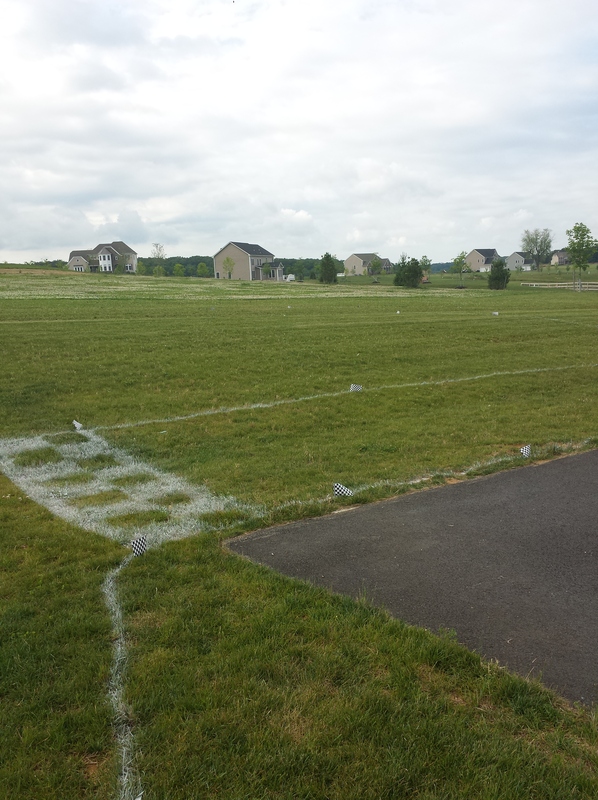 We kept the cars out of sight until it was time for the race, which was a stroke of genius on my husband’s part. Once those cars were out, only the mention of cake tore the kids away from them! I can’t really take credit for anything but the execution of these ideas! I found everything via Pinterest and Google searches. 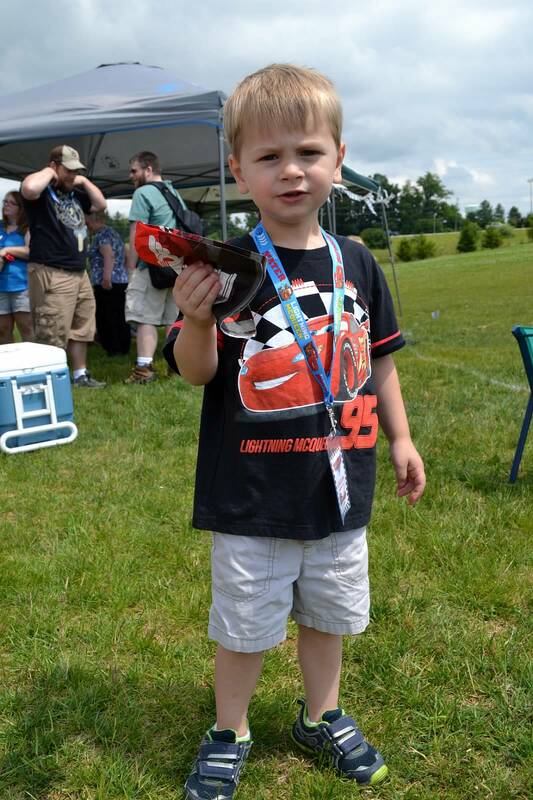 These Pit Passes looked really cute and the kids could wear them during the party, but also keep them as a favor. I got the lanyards from Party City and the plastic holders from Amazon. I designed and printed the passes myself. 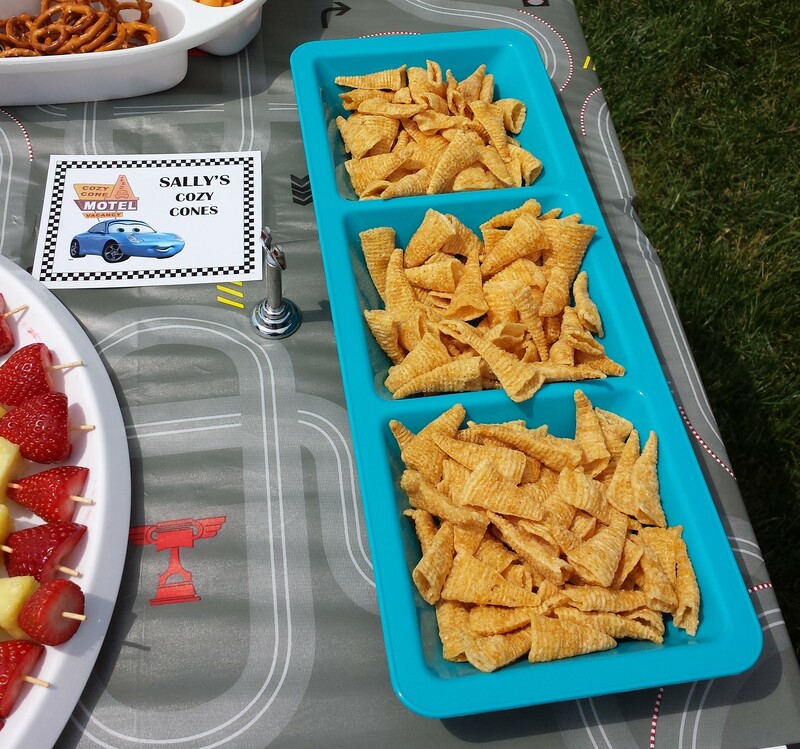 I also grabbed some little trophies so that each kid could take home their own Piston Cup. They are really, really small so I couldn’t even fill them with treats. As it turned out, we weren’t able to set the Pit Passes and Piston Cups out on a table as I had planned (wind!!) so Caelan handed out the Pit Passes and we just forgot to give out the Piston Cups. These were supposed to be stacked into a tower, but I skipped that because of the wind (it was REALLY windy!) 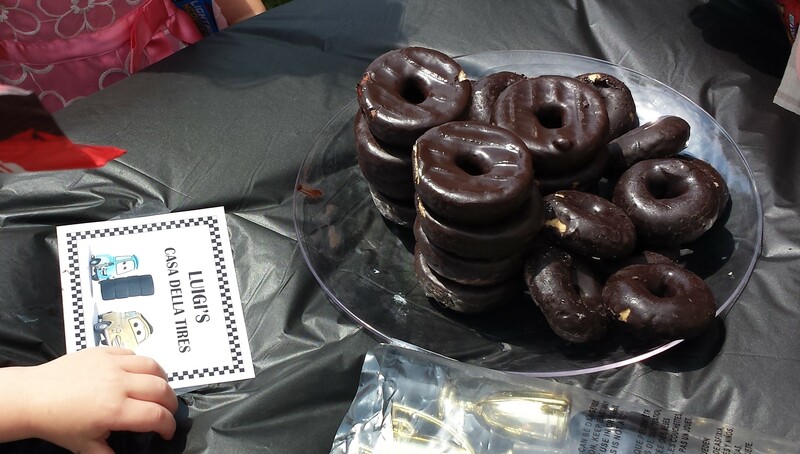 but these got demolished so quickly it didn’t matter! We had several folding tables set up with red and black plastic table cloths. I ordered plates and napkins from Amazon (because it was cheaper than the party store, which is not usually the case for party supplies!) and got the rest from the party store. 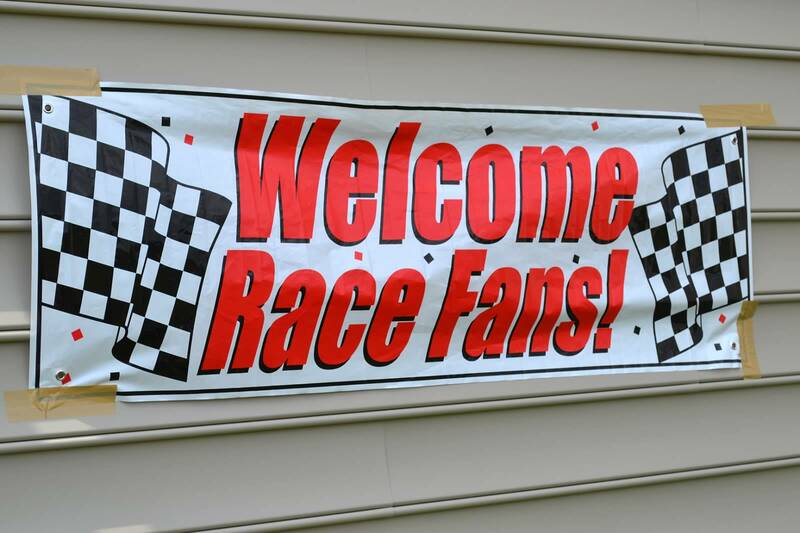 We had checkered flag banners, a race banner, and little mini checkered flags. I don’t have a lot of good pictures of these things because – you guessed it – wind! Caelan has been sick a lot this past year. 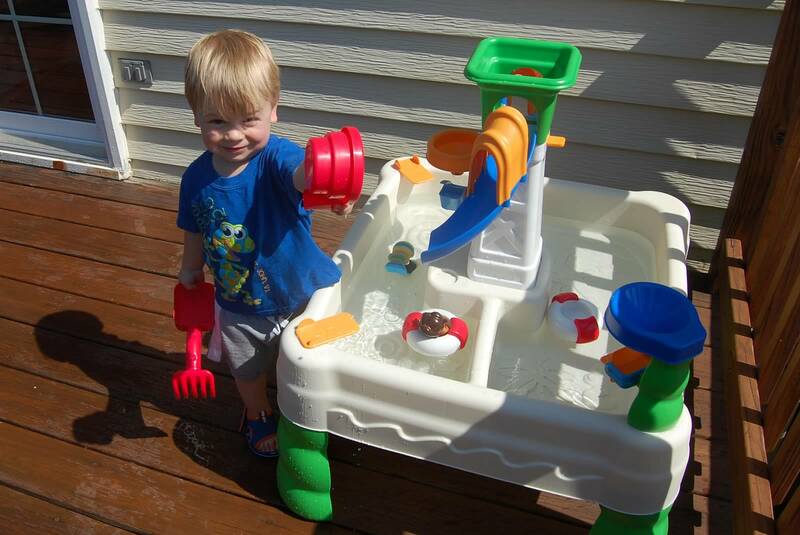 Stupid daycare germs. 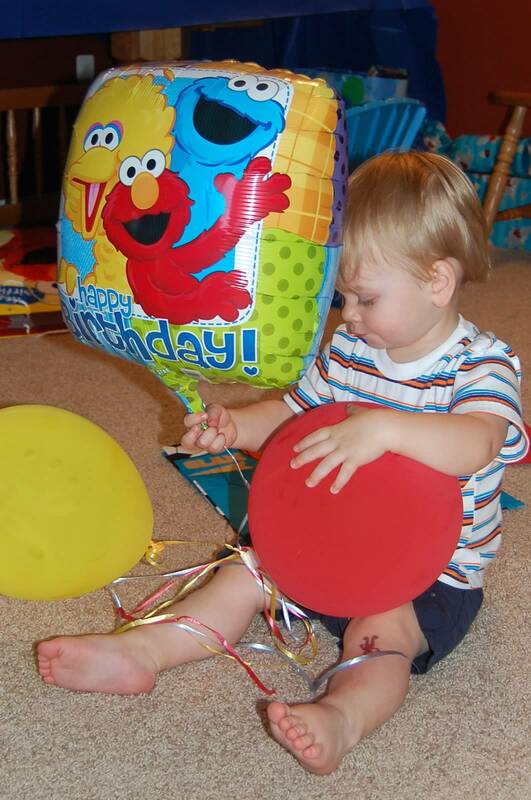 We hoped he’d be well for his party since he had just got over his last sickness about 2 weeks before, but no such luck. The birthday boy got sent home from daycare on his birthday with a fever. Luckily, by the next day he was fever-free and though he wasn’t quite back to his normal happy self, he was a total trooper all day long! He seemed to have a good time chasing balloons and playing with new friends, so overall, it went well! Table Display. 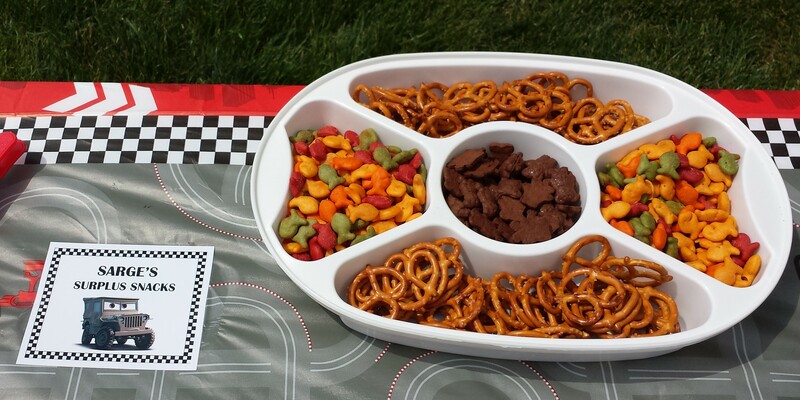 The smash cake and cupcakes doubled as the center piece and we filled in with lots of simple, classic party foods like sandwiches, chips & dip, veggies, meatballs, etc. Caelan’s Month Pictures. This was probably my favorite decoration. 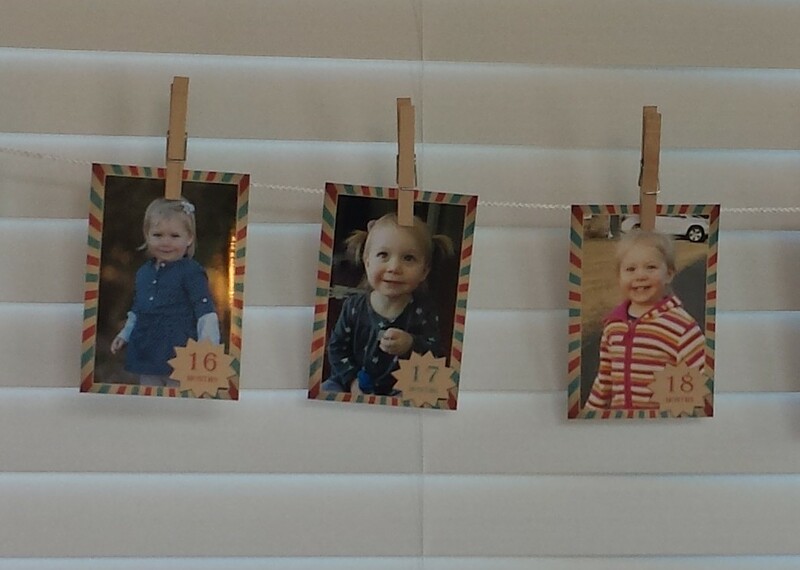 I got these cute little jungle placecard holders and mounted each of Caelan’s month photos on colored cardstock. The banner is also just cardstock and ribbon in coordinating colors. Party Supplies. 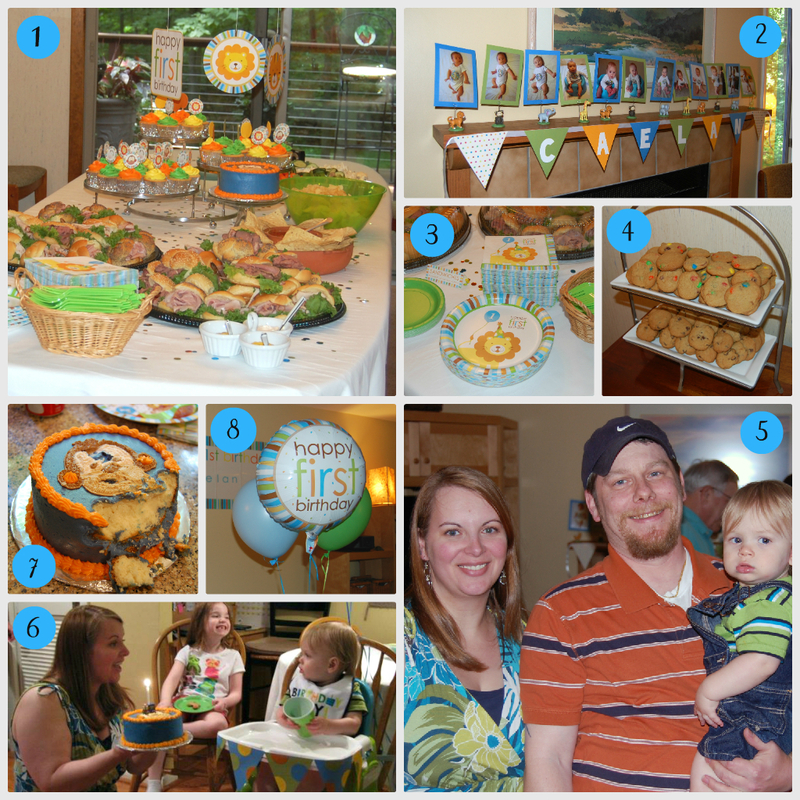 I chose the Sweet at One Boys 1st Birthday set from Party City and that was the “theme” for the party. Cooooookies. My sister made two batches of chocolate chip cookies. She makes the best cookies! Family Pic. This is the best one from my camera (thanks to my brother-in-law for taking pics!) but there seemed to be tons of people standing in front of us taking this same pic, so if anyone got one where Caelan’s looking at the camera, let me know! Singing Happy Birthday. Caelan is definitely giving me a WTF face. The whole singing/everyone staring at him thing was weird, but he did pretty well! Birthday Balloons and Banner. 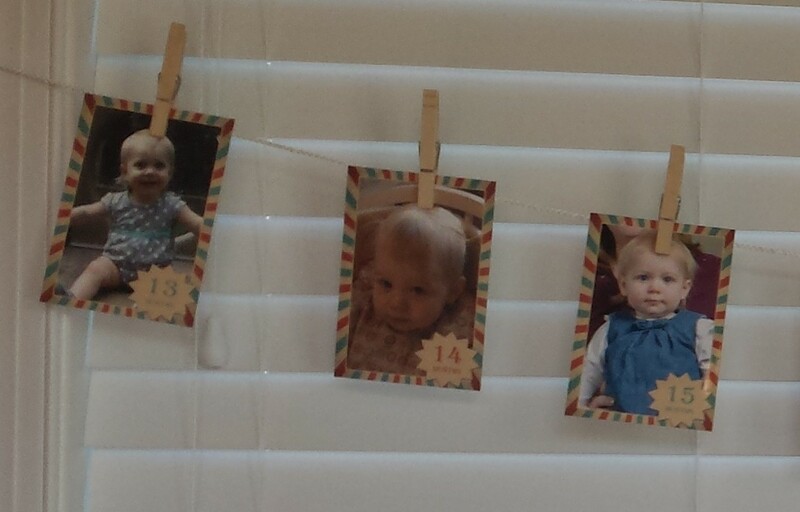 I only got a few balloons for the highchair and the lamp post outside, but now knowing what a hit they were with the kiddos, I wish I had bought more! The party was so much fun and I’m so happy with the way it came together. Almost all of our guests were able to attend, Caelan got to meet some new friends, Bill & I got to visit with some friends we hadn’t seen in awhile, and everyone was there to happily celebrate our baby’s 1st birthday! 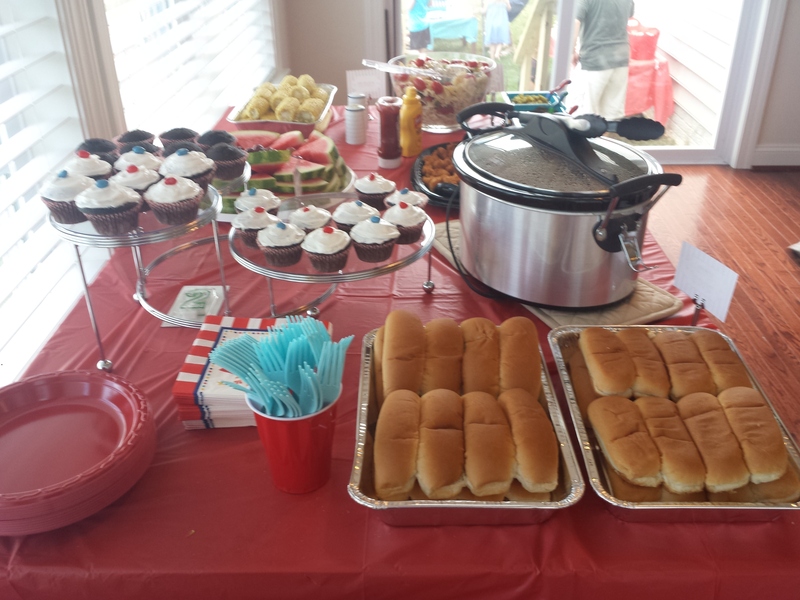 Thank you to my parents for letting us have the party at their house, my aunt and brother-in-law for helping with set up, my sister for baking cookies and helping with set up, and to my mother-in-law and sister-in-law for bringing yummy fruit and pasta salad! Mixed emotions going on here, but I have been focusing on party planning for the past month or so. Well, party prep really since the planning has been going on a lot longer than a month!! I will have a post or two to share with you after the big day, but I’m going to share one thing beforehand. 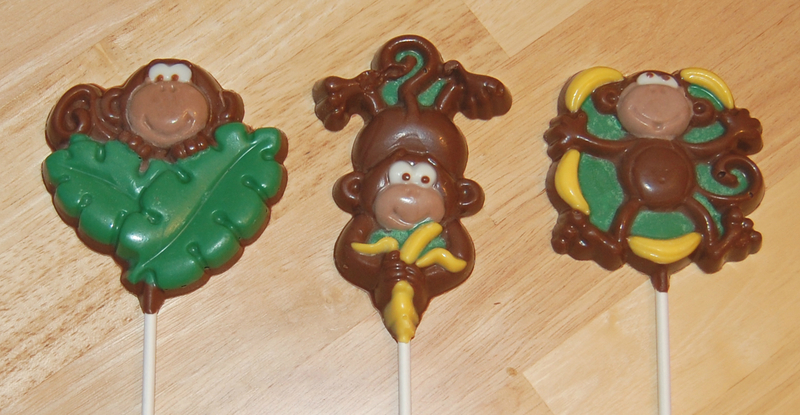 And since we’re doing a jungle theme and our nickname for Caelan is “monkey” well, I just had to make these lollipops! I picked up all of the supplies I’d need at JoAnn’s and since I’d never made lollipops before, I checked out a couple of YouTube videos with demonstrations. It’s not rocket science, but it is meticulous and time consuming work. Once I got the hang of it, I could make 6 in about an hour. So a few evenings a week over the course of a few weeks, I made lots and lots of lollipops! I had a little trouble with the green candy in particular – it tended to stick. Not sure why. 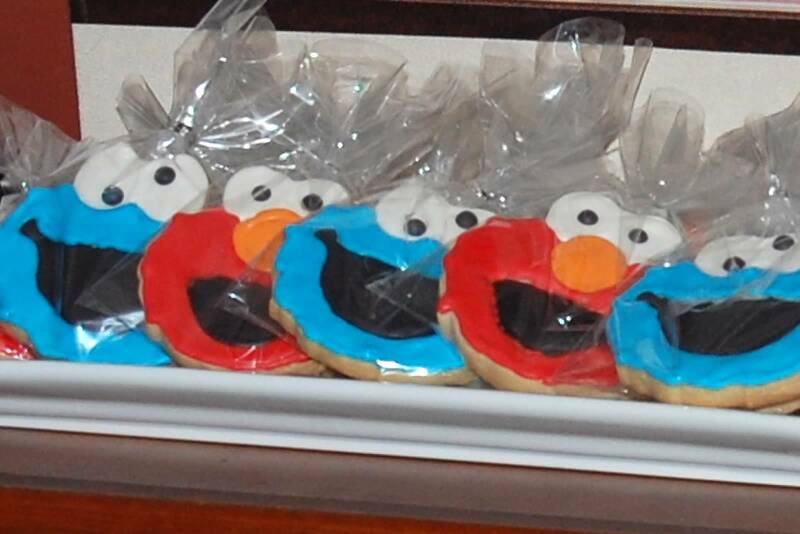 But overall, I love how they came out and I think they will be perfect for our little monkey’s party! 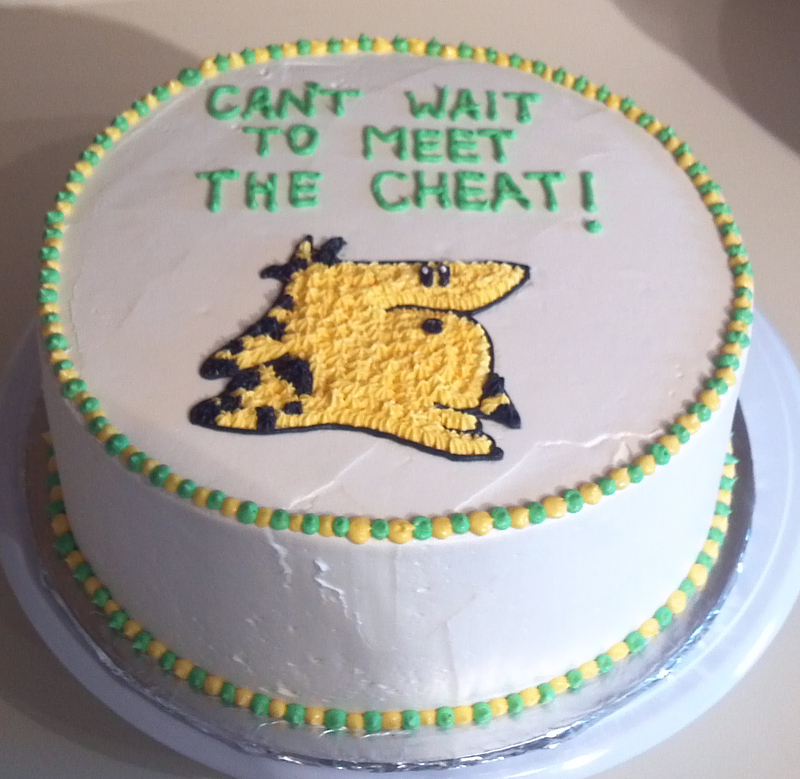 Can’t Wait To Meet The Cheat! Heidi is a dear friend who just welcomed her beautiful daughter into the world just this past week! We met about 3 years ago when we were both planning our weddings and have stayed in touch, along with several other girlfriends, since then. 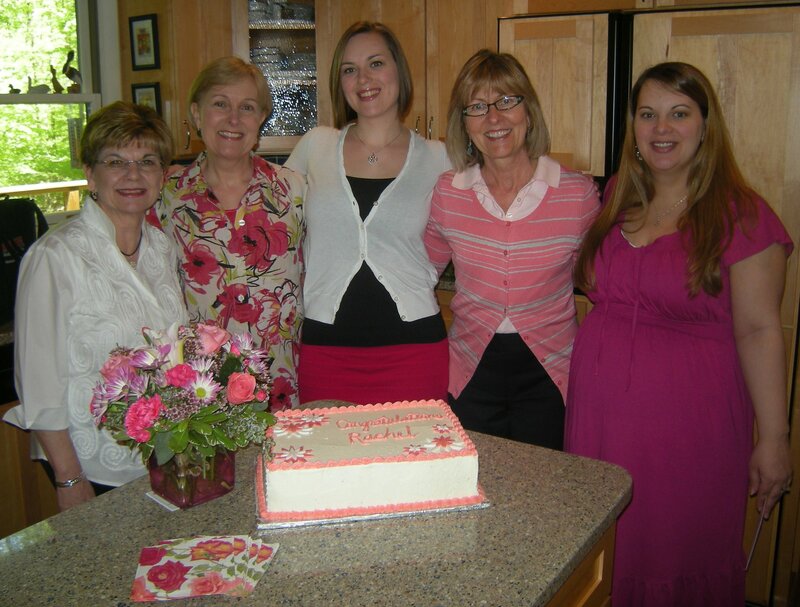 I was very excited to be able to make the cake for Heidi’s baby shower which was a couple weeks ago! This cake was the first cake I’d made since Caelan was born. It was…challenging…but I was able to do it over a Friday and Saturday when Bill was home, so he could watch the baby while I baked and that worked out well. I don’t think I could make a cake without having someone watch the baby – it just requires too much time. Heidi and her husband, Brian, nicknamed their baby “The Cheat” while she was pregnant. I decided I’d make a round cake and draw a picture of The Cheat on it. I was all excited about this idea until I saw a picture of her cake for her family shower and realized that it was almost exactly what I was thinking of! Not sure why I was surprised, it was kind of an obvious (and appropriately cute!) idea for a cake. 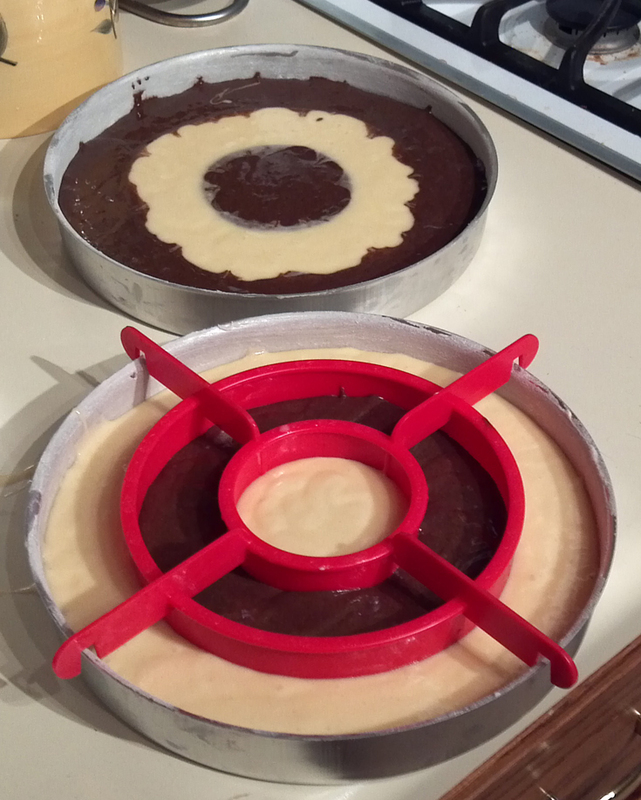 I have a set of cake pans that my sister-in-law gave me for making a 9” round checkerboard cake. I used box cake mix – one vanilla and one chocolate. Heidi said she liked chocolate so I made a chocolate mousse filling. I covered the cake with vanilla buttercream. I printed out a picture of The Cheat and traced it onto wax paper which I then used to trace an outline onto the cake. I colored some of the frosting yellow, black, and green to fill in The Cheat and do the writing. This cake turned out to be one of the best ones I’ve ever made. I was really pleased with it, and I am normally so critical of my creations that I’m not often really happy with anything. Somehow I didn’t actually eat this cake. That often happens – I’m more interested in making cake than eating it – but I should really make it a point to sample my creations! But I’m happy it went over well at the shower! On April 30th, I co-hosted my sister’s bridal shower. I am so glad that even though I was 35 weeks pregnant, I was still feeling good and able to contribute! I was also in charge of favors which is something that usually falls by the wayside because people either forget to take them or they just toss them. But I love favors and wanted to do something cute. 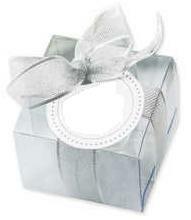 I picked up a favor kit from Michael’s that came with some clear boxes and silver ribbon. I think edible is the way to go, so I went on the hunt for some kind of candy in a pink wrapper (pink is my sister’s wedding color) and I found Hershey’s Bliss Dark Chocolate pieces. I ordered some stickers from VistaPrint for the labels that match the invitations and voila – favors 🙂 I wish I had a picture of the actual favors, but I don’t. 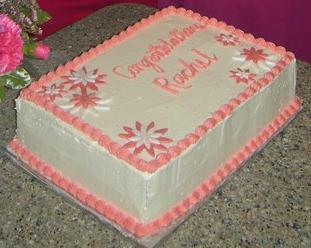 Rachel asked for yellow cake and vanilla frosting – simple as can be!! I decided to try out a new yellow cake recipe and went with this one from Smitten Kitchen. Deb’s carrot cake is fabulous, so I figured I could trust another cake recipe from her. The cake was less moist than the Wilton yellow cake I usually use, but it was dense and carved well. It held up very well to being sliced in small pieces. I made 2 recipes for a 2 layer 1/4 sheet cake. The layers were very tall, so the cake overall was too. I’m not sure whether or not I’ll make this cake again, but I will keep the recipe if I need a very sturdy cake. For the icing I made this flour icing (I never know what to call it!). 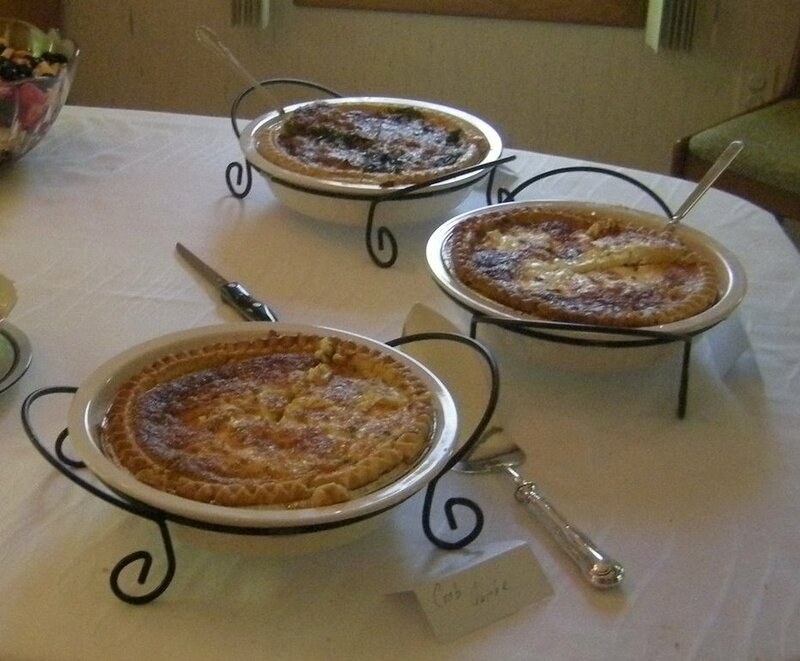 As usual, I think I got the heating of the flour/milk mixture wrong – or was it the cooling? All I know is when I mixed it into the butter/sugar mixture, I got tiny sesame-seed-sized bits of the flour mixture that wouldn’t mix in 😦 I did not have the separating issue I had the last time I made this frosting, so maybe I just need to give it a 3rd try. It is very tasty and is refreshingly different than normal American buttercream. For the decorations, I cut daisies out of fondant and painted them with red and white pearl dust. I love using the pearl dust because it always looks so nice! I do NOT love mixing up pink icing. I can never arrive at a nice color of pink and I usually end up somewhere around a coral color. The rest of the shower, my “aunt” took care of. My sister is a vegetarian, so 95% of the food was vegetarian also. 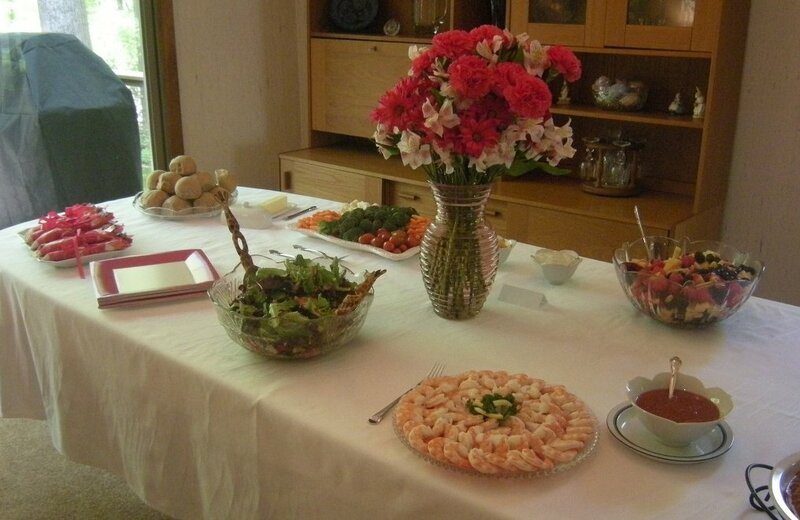 There were several varieties of quiche, a fruit salad, a green salad, steamed shrimp, and veggies.